back to school or college? HFS Bexhill has a huge Office Furniture department. Pick up an affordable reused desk, chair, filing cabinet and get your studies organised! 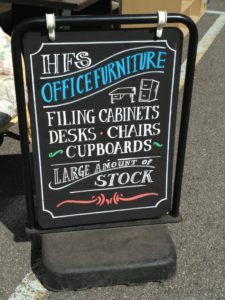 The store in London Road, Bexhill has a variety of items in stock, from small computer tables through to huge corner desks. If you are a Full-Time student bring proof of your enrollment for 10% off + free local delivery (Hastings Borough or Rother District areas). If your household receives means-tested benefits such as Working Tax Credit or Housing Benefit, bring proof of this for 30% off and free local delivery.